The legend goes that King Canute of England (1016) had his throne brought to the shore of the ocean. Sitting with his arms raised, he announced “You are part of my dominion, and the ground that I am seated upon is mine, nor has anyone disobeyed my orders with impunity. Therefore, I order you not to rise onto my land, nor to wet the clothes or body of your Lord.” But, alas, the sea didn’t give a fig about the king and continued to rise, soaking his feet and legs. Where am I going with this bit of medieval history? Well, I may not be a king, but some have called me a princess (among other names). And, just like King Canute, I’ve been waving my arms at the sky, shouting orders for the snow to stop! And just like the good old king, I’ll be waving my arms at the river, ordering it to stay away from my basement. “Back, back I say. Dare not make my belongings wet or destroy my water heater.” I’m sure I’ll have about as much success as ‘ole Canute. 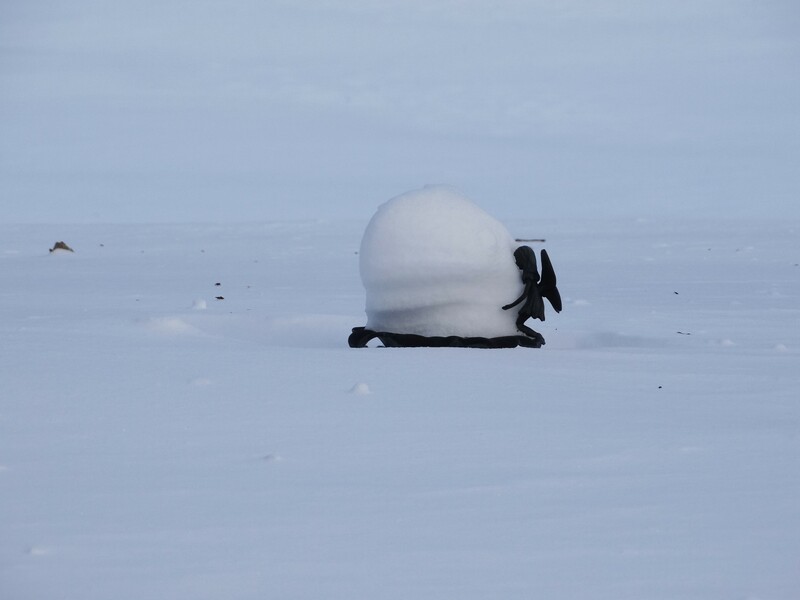 Let’s put the depth of the snow into perspective. This garden decoration is four and one half feet tall! I am so screwed when the snow melts. Thanks to the massive snowfall amounts, however, I have gotten a new view of the river, mainly from my roof. Both Chris and I have spent many a pleasant afternoon (okay, pleasant might be a slight exaggeration) on the roof, shoveling off the snow and spreading snow melt like Johnny Appleseed. Chris, being a very good boy and shoveling off the roof. Our goal was to avoid damn ice dams. Again, we’ve had the same luck that King Canute had–zippo! … before the ice dams formed. I could only reach so far with the roof rake. Oh joy, here come the ice dams. What actually is an ice dam? They’re crystal stalactites from Hades with a massive log of ice blocking the flow of water that melts next to the roof shingles. (Phew, that was a mouthful!) With nowhere to flow, the water backs-up under the shingles and into the house. 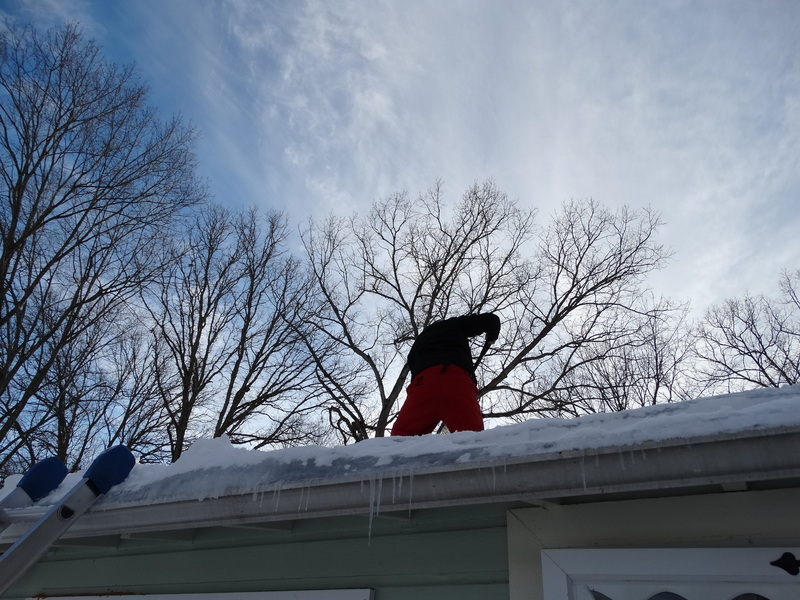 We hardy homeowners try our best to remove the snow off the roof before it melts and forms the damn dams. Yeah, good luck with that. It’s not easy being on the roof, wielding a shovel, roof rake, and holding on for dear life. Not only are they not waterproof, UGGs are also short on traction. Sunday, while I was on the roof, a flock of bluebirds descended on the yard. I had a choice, continue shoveling and risk slipping off the roof and breaking my neck or climbing down the ladder to get the camera. Bingo, you got it right! Any day where you can watch a flock of bluebirds instead of shoveling a roof is a very good day. What made the day even better was the little tête-à-tête between a male Northern Cardinal and his lady love. Gallery | This entry was posted in Life on the Concord River and tagged baby boomer blog, blog about life, blog about living on a river, blog about New England, blog about owning a home on a river, blog about the snow, bluebirds eating suet, Canute and the tide, Dr Ian Malcolm of Jurassic Park, Eastern bluebirds at suet feeder, Eastern bluebirds in the winter, how ice dams form, ice dams, Jurassic Park life finds a way, Jurassic Park quote about life, King Canute hold back the tide, King Canute of England, Life finds a way, life on the concord river, living on a river, living on the Concord River, male cardinal feeding female cardinal, middle age woman blog, middle aged woman living alone, Northern cardinals mating, quotes about time, record snowfall for Boston, record snowfall for New England, removing snow from the roof, River Lady, riverlady, single woman living on a river, snow on the Concord River, snowfall in New England, stories about living on a river, stories about living on the Concord River, time and tide waits for no man, what is an ice dam. Bookmark the permalink. 4 Responses to Time and tide wait for no man (or woman)!